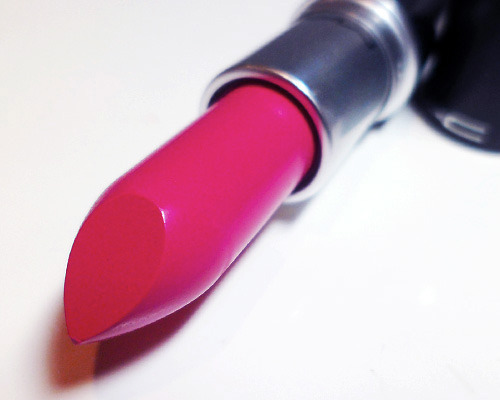 The Makeup Box: MAC Quick Sizzle Matte Lipstick Dupes! Quick Sizzle is the sell-out shade in the limited edition Shop MAC, Cook MAC collection. It’s just been released in Asia, and the first shop I hit was already out of this shade. Don’t you just hate it when the gorgeous colors are all limited edition??? If you missed out on the shade and can’t get hold of it, PLEASE don’t trawl through eBay trying to buy it at exorbitant prices. There are 2 shades that are REALLY similar. BOTH are cheaper. Unless you're a MAC collector, you probably don't need to pay US$14.50 for Quick Sizzle. In the tubes, they look different. 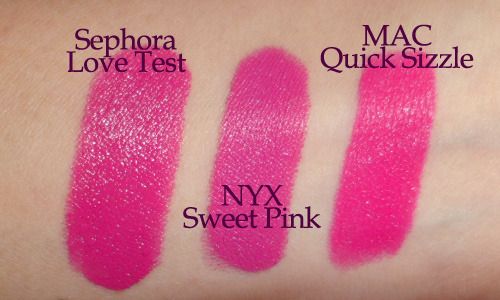 Swatched, the difference in shades is visible but minimal. On the lips - believe me - NOBODY else will really know the difference. Quick Sizzle has a hint more red/warmth than the other 2 lipsticks, but they’re the same sort of flattering, rosy fuchsia pink that doesn’t look neon, doesn’t look red, can be worn on a weekend OR for work, and goes with SOOO many skin tones. Beautiful bright color! I wonder if its similar to Mac Something New? I'm a sucker for the brights! Hi Jillian, they're in a similar family but I'd say Quick Sizzle is a touch deeper and stronger. I don't have Something New though, so this is a guesstimate! OMG!!! So...so thrilled to find a suitible dupe for this! But at least you guys can just go for the dupes now!